Good grief, it's more probably illegal comic strip scans and boring childhood reminiscences from MPorcius. The 1989-90 volume of The Complete Peanuts is introduced by Lemony Snicket, whom I had thought was a fictional character until he turned up on the cover of the journal Poetry last year. I guess he hit it big after I left the bookstore. Snicket doesn't let on what he thinks about George W. Bush or South East Asian politics in his intro, leaving us to guess. This volume feels a little weak compared to earlier ones. There are way too many strips in which the punchline is "Snoopy loves cookies." 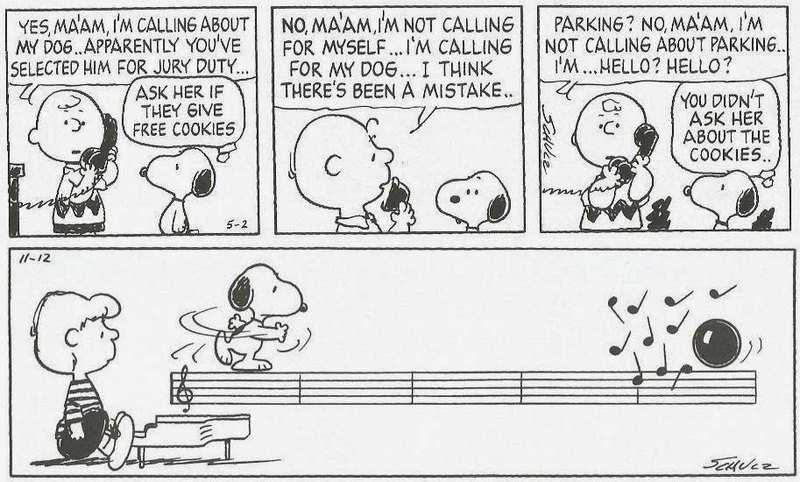 The idea of Snoopy being called for jury duty is a good one, for example, but this arc includes too many cookie jokes. There are also too many strips which consist of Snoopy physically interacting with the sheet music that appears in the strips with Schroeder. There is a dearth of the Schroeder strips which I like, those in which Lucy courts and is rejected by Schroeder. Those strips add depth and sympathy to Lucy's character; she may be a force of evil, but her interactions with Schroeder humanize her, show that she goes through the same painful unrealizable desires that so many of the other characters, and of course most of us readers, have endured. The strips with Snoopy and Schroeder may be pleasant to look at and were likely fun for Schulz to draw, but they lack human feeling. There are also lots of mediocre strips in which characters relate something about a grandparent. Franklin shows up in most of these, either telling a story about his grandfather or listening to such a story from Charlie Brown or Linus. I feel like Franklin was never really as fleshed out as most of the other characters, perhaps because most of the characters in Peanuts are defined by their insecurities, obsessions, or anti-social traits, and it would be risky for Schulz's only black character to be defined thus. It would also be counterproductive for Franklin to have some weird character flaw if the point of him being in the strip is to express Schulz's opposition to racism. So Franklin ends up being a sort of bland straight man. There are good things in this volume, just fewer than earlier ones. The plot arc in which Marcie and "Charles" go to summer camp, but Peppermint Patty has to stay behind to attend summer school, is not bad. Patty and Marcie both have a crush on Charlie Brown, and in one strip that took me by surprise Marcie torments Patty over the phone by claiming that "Charles" is nibbling on her ear! Schulz wasn't lying when he said the strip wasn't made for little kids! A few of the Peppermint Patty and Marcie strips in this issue address feminist issues. 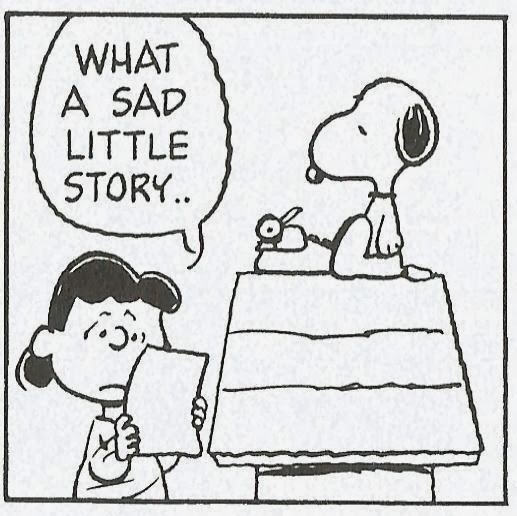 I've sometimes wondered if there has been a feminist analysis of Peanuts, if feminists have complained of Schulz's depiction of the female characters, who are often villainous, like Lucy, Violet or the evil blond Patty (who grins while she physically assaults a boy in the very second Peanuts strip back in 1950), unobtainable goddesses like the red-haired girl or Miss Othmar, or, like, Sally Brown and Peppermint Patty, selfish, negligent, and academically incompetent. And let's not forget the vain and vapid Frieda. When the female characters argue feminist points Schulz tends to make them look ridiculous. There is a famous strip in which Lucy proclaims that scientists have discovered that women are superior to men. (What scientists? someone asks. Women scientists!) In this volume Peppermint Patty is angered when the TV sports show only talks about mens' sports, so she marches down to the TV station to yell at the station manager; the manager turns out to be a woman. The late July- early August 1989 plot, in which a girl thinks Snoopy is a boy named Charlie Brown, is fun, maybe the highlight of that year. The highpoint of the volume, however, is the "Brownie Charles" sequence which begins in July 1990. At camp, Charlie Brown meets a pretty girl and falls in love (in a flash he forgets all about the red-haired girl back home) but is so nervous that he mangles his own name when she asks it, with the result that she calls him "Brownie Charles" throughout their entire relationship. When I was in first grade I got so nervous that I similarly mangled my own name on the first day of school when talking to a teacher, an event mortifying enough that I still think about it with a shudder. So, despite my criticisms, the 1989-1990 strips are well worth a read. Pigpen fans (I know you are out there) will be glad to know that in 1990 Pigpen gets his own story arc, in which he runs for class president. The monstrous blonde Patty makes a walk on cameo in this arc. Finally, the fact that the name of Garry Trudeau (whom Schulz in an 1987 interview denounced as unprofessional) is misspelled on the dust jacket is worth a laugh.